During the Chippendale era, Windsor furniture carried on the turner's tradition. Included in the Windsor family are stools, tables, settees, high chairs, cradles and candle stands, but the best known are the chairs. Windsor chairs were developed in the late 17th century in the vicinity of High Wycombe but named after the local big town of Windsor, Berkshire, England. Windsor is situated on the Thames. It is said that Windsor Chairs appeared in America in 1726 when Patrick Gordon was appointed lieutenant governor in Philadelphia. He brought his household furnishings from London, which included five Windsor Chairs. The Colonists were intrigued by these and started copying them. Windsors are all-wood chairs with interlocking parts that were delicately turned or simply cut. The back was made of turned or whittled spindles enclosed by a curving or straight rail. The solid seat was shaped to fit the body. Legs were turned, set at an angle, and reinforced by turned stretchers. One reason for their sturdiness was that parts were made of green wood, which later shrank until the joints were tight. There are seven recognized styles of Windsor chair: saw back, hoop back, comb back, low back (also known as captain’s chair), rod back, fan back and continuous arm. From the beginning Windsors were simple, relatively inexpensive chairs, intended for daily use. While formal furnishings were made from fine woods such as walnut and mahogany, chosen for their bold color and figure, Windsor makers used a variety of woods selected for their structural qualities and mixed them indiscriminately -- birch and maple for their ability to take sharp detail on the lathe; oak, hickory and ash for strength and bend ability; pine, poplar and basswood for their workability and light weight. The resulting mixture was unified with a finish of paint. The paint was usually “milk paint”, often a light color over-painted with a dark color and then coated with linseed oil for protection of the fragile paint. With wear in use, this paint wears off around the edges and displays a characteristic wear pattern that reveals the paint colors underneath. Since Windsor chairs were being made in large numbers in Philadelphia by the mid-18th century, they were sometimes called "Philadelphia Chairs" The first style made there had low backs, followed by fan backs, sack backs and bow backs. A New England version was fashioned with a continuous hoop and arm. During the second half of the 18th century, Windsors were being made in quantity in most major American cities, and Connecticut became an important Windsor manufacturing center. 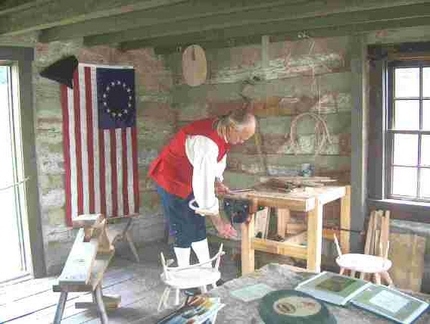 One of the most important Connecticut craftsmen working in this style was Colonel Ebenezer Tracy (1744-1803). The Colonel, who lived and worked in Lisbon, Connecticut, created a unique and beautiful style, one marked by bold turnings, widely splayed legs and painstakingly carved seats. Along with his three sons, two sons-in-law, and various apprentices, they created thousands of highly distinctive chairs in various forms - writing arm, fan back, bow back, continuous arm and settee, among others. Today, surviving Tracy chairs are highly prized by collectors. One interesting opportunity exists for people interested in creating their own Windsor chair. The Windsor Institute in New Hampshire will teach people how to make the chairs in five-day classes that are held several times a year. People of all skill levels can learn this British and then early American art form so they can create beautiful handcrafted chairs on their own. See our collection of Windsor chairs. 1. Field Guide to American Antique Furniture by Joseph T. Butler (c) 1985 Joseph T. Butler and Roundtable Press, Inc.